PST to EML Converter performs automated scanning of PST files into EML file format. This provides an access of the emails and display of the emails in the left pane window. Choose the folders having PST files, load them and view the emails as well as other items. You can also utilize Find option for selecting those PST files which you wanted to export rather than all. The software gives facility to acquire preview of the emails generated for easily accessing the items before you make final email data migration. What free trial run of the software is capable of? Free Demonstration edition is like free trial trip that any user can go for. It helps users to test the functioning of the tool and let users access the process to migrate PST files into EML file format. The tool will migrate first 10 emails from Outlook PST into EML. This let catch complete idea of tool actually performs the email migration procedure. Thus, one gets ease of accessing the proper working prior finalizing the tool’s purchase. What about working process of PST to EML Converter? Sysessential PST to EML is simple to execute application. The functioning is so easy that even less techie guy won’t come across any hurdles. Thus, look forward to export emails from PST and EML. The procedure is extremely comfortable thus purchase of the software is favorable with a doubt. Is folder hierarchy maintained while data export from PST into EML? How many EML file format supporting email clients supporting by the software? PST to EML Converter does not support, one two and three email applications supporting EML file format. In fact tool moves emails from PST files into EML and afterwards, one can access the emails in any of the email client supporting EML file format. Is software workable with all Windows OS editions? Is software supportive of all Outlook editions? Software supports to work with all Microsoft Outlook versions including ANSI and Unicode supporting file formats. Thus before making email export, you are hardly required to take any worries about file formats. What is the purchase facility in the tool? The software goes through easy purchase formality. The payment is easy as well. If you have made up your mind in buying the application to fulfill the need of accessing PST into EML then just look for buying the tool in fully operable mode by going through easy purchase formality. The mode of payment is extremely comfortable as well. What is reliability factor goes with the software? The tool gives ease and reliability to a high extent. The email migration procedure is absolutely reliable and does not affect data in any way. You can’t even troubles like virus attacks etc like scenarios with the tool. It is virus protected application. Install the tool and start using it for fulfilling ultimately email migration need. If a person is non-technical, then migration can be successfully done or not? 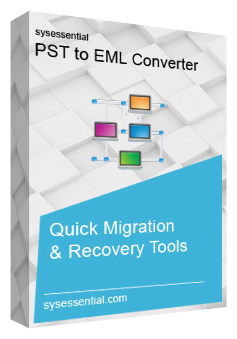 The tool is purposely created for migrating emails from PST into EML file format. Being a non-technical guy does not mean that you will be exempted from seeking the benefits of the tool. Just purchase the application and tool will start commencing email export in few easy steps and in an automated way as well. Hi, I am Julia Stewart and would like to share my experience with Sysessential for PST to EML Converter. I was in quick need for migrating all the emails from PST files into EML file format and unable to make out what to do. Firstly, I tried using manual method but it was a long process but later I decided for automated application and thus decided for Sysessential for PST to EML. The experimentation with the software was awesome. It migrated every email from Outlook PST to EML file. Surprisingly, the export process got over in few mouse clicks. I previously thought that email migration process of emails from PST files into EML is tough but Sysessential for PST to EML changed all my thoughts. It has migrated all the data from PST file format into EML with extreme safety. What else a professional wants? The precision with the tool was excellent. In fact, it converted emails in the blink of an eye. I am happy with the functions of the software and want others to buy it soon for fulfilling email conversion needs.